For substantive, non-partisan reasons—really!—I like this poll result. 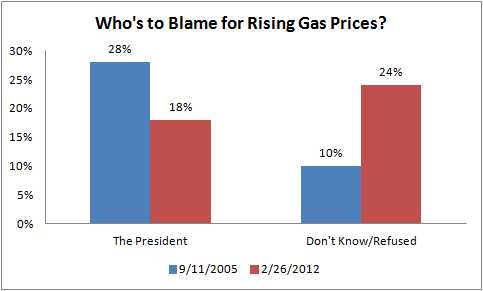 It’s just a snapshot and I’m sure these sentiments are volatile, but it shows that fewer people blame the president for the current spike in gas prices, and more people just don’t know why prices spike like this (or refused to answer; back in Sept 2005, gas was around $2.90 and spiking—that’s about $3.50 in today’s $’s). Source: Washington Post/Pew Research Center. That’s a good sign, because there’s just about nothing a president or any other policy maker can do about this in the near term. More drilling wouldn’t help and, in fact, domestic energy production is way up. There’s a lot of noise about the White House’s decision to deny (I’d say delay) the permit to construct the Keystone XL pipeline, but anyone who argues that had the decision gone the other way, prices would be lower now, is just blowing smoke. Even were that pipeline completed, the oil it was to carry was to be refined here and exported. It would thus amount to a small drop in the barrel of global supply and its impact on prices at the pump here would surely be very small. BTW, only 1 percent of poll respondents—again, correctly in my view—argued that “Not using U.S. resources/Not enough drilling in U.S./Environmental restrictions” were responsible for the spike. Those are all longer term issues, and you just can’t get away from the fact that oil is a heavily demanded, non-renewable, global commodity of which the U.S. share of production is less than 10 percent with known reserves is in the 2-3 percent range.